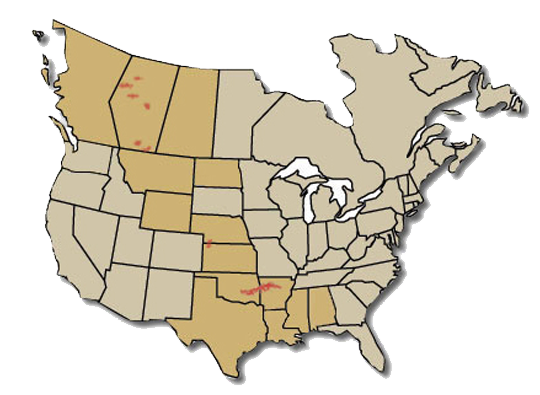 Hanna Oil and Gas produces in a large area of the USA from Texas to Montana. Beginning in the mid 1980’s we expanded into Canada and currently work in two core areas, Cretaceous oil and gas plays in southeastern Alberta and the Peace River Arch in northwestern Alberta. Beneath the surface of the Arkansas River valley sits a 20 to 50 mile wide arcuate shaped basin that is estimated to contain 40,000 cubic miles of primarily Pennsylvanian aged sediments ranging in thickness from 3,000 feet on the northern shelf bounded by the Boston Mountains and the Ozark Dome to a probable 30,000 feet to the south along the leading edge of the Ouachita Mountains. Stretching approximately 250 miles from near McAlester, Oklahoma to near Russellville, Arkansas, the dry methane natural gas producing Arkoma Basin is one of several foreland basins associated with the fronts of the Ouachita and Appalachian Mountain systems of the eastern and southeastern United States. The first discovery of natural gas in the Arkoma Basin occurred in Fort Smith in 1887, but it wasn’t until two wells discovered natural gas about 20 miles south of Fort Smith in Mansfield in 1902 that commercial development began. Following those discoveries development was sporadic, but in 1959 several large reservoirs of natural gas were discovered in Latimer County, Oklahoma, about 23 miles east of McAlester, kicking off a vigorous leasing and drilling campaign that still continues today.